The tefilin are kosher you may put them on with a bracha, till you find paint to repaint the bayis. 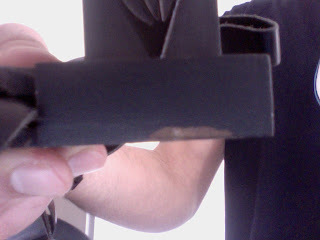 The black paint and the crack, are not me'akev at all. is this a common thing that happens in Tefilin that are only 2 and a half years old? Could this mean the quality of the paint was low? 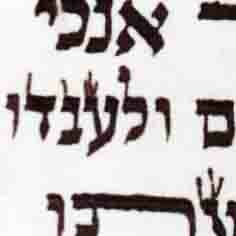 As far as the bayit shel rosh, there is one compartment which is separating, they are mikshe. Is this because of that or poor glue quality, or the manufacturer? I would say that the tefilin shel yad and rosh that are practicaly new [2-3 years for gasos is realy new, unless you handled them very rough] and paint coming off, and the batim shel rosh opening - is definitly poor quality made. What type of shel rosh do you have - chabad or regular? 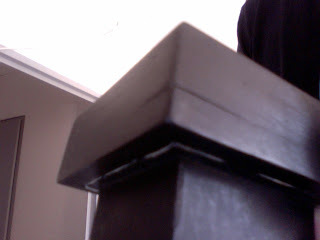 Because chabad are suppose to be without glue inside, so the opening is much more common! 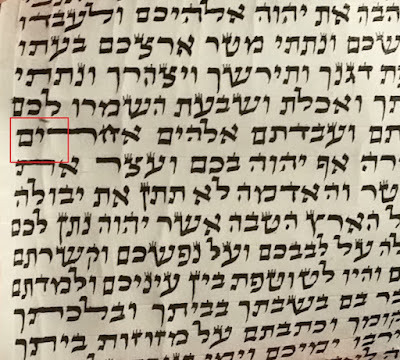 BTW, I think you once asked advice about what a Sofer should have/learn etc... besides for the books they mentioned, I also highly recommend "Yalkut STAM" which is basically like a chitas, where you finish the halachot every month, and he also highlights where the Alter Rebbe or other Poskim hold otherwise. If you read English well, Rabbi Askotzky's "Tefillin and Mezuzos" is also a very good book. I also really like the sefer "Maase Sofrim". Thank you for your response, BTW, how much of a difference is posul when checking with the caliper? I see that on the list your name is: Moshe Rothbart. Are you by any far-chance a descendant of Rothbart family from Cincinatti Ohio USA?? 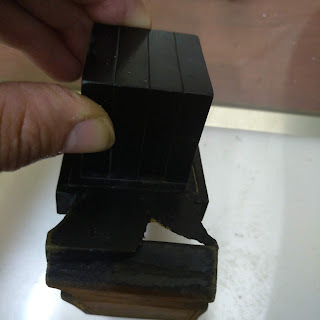 Reb Moshe, I dont have chabad tefillin, I handle them very well, always in room temp, and very carefully, I also payed extra to have them from a company that is considered top quality so this situation is very strange. I did not get them from the company directly but rather from a socher. I don't know of any family in Ohio, I know that there are very few Rothbarts out there. My family comes from Budapest and Bratislava. If the tefilin are not chabad they should not open in such short time. The socher gave you batim that are not the best. The crack on the titurah and teh chipping paint has nothing to do with the quality of the batim, it has to do with the person who did the hermetic sealing. He obviously did not put a lot if any glue inside. Moisture may have a lit to do with it, try avoiding use with wet hair. and according to the klausenberger rebbe if they open its still mehudar. you can try keeping a rubber band around the top, it might keep it together. R' Sholom Elishevitz, a sofer in NY tought me a trick how to rectify batim splitting on the top. 1) Tear out the felt from the inside of the plastic tefillin cover, on either side where the shin goes. It should come off in one piece. 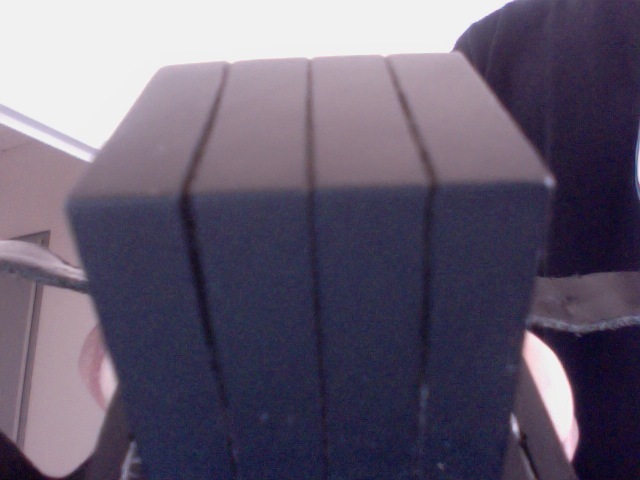 2) Put double sided foam tape, enough to make the plastic cover more narrow and reinsert the felt paper. basically the double sised tape is between th efelt paper and the plastic inside wall, so you now have a tight fit. 3) Reinsert the rosh and it should go into the cover very smug. It might be hard to move the bayis in and out but not impossible. This will act as a clamp for the 23 hours or so a day when the teffillin bayis is in the cover. It will improve the ribuah and definitely stop it getting worse or splitting further.